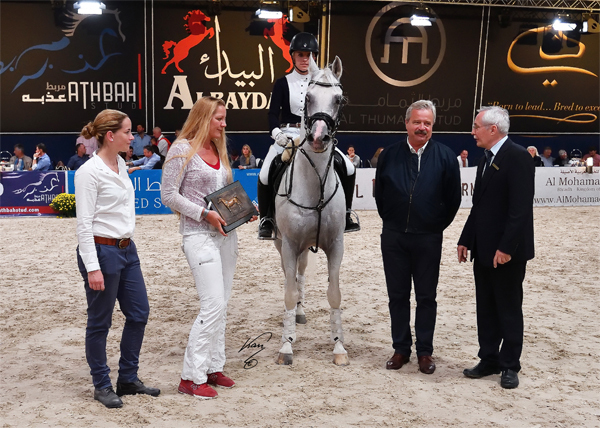 AL ASHAR by ASHUR out of ASWANA bred and owned by Mrs. Helena Hecker was awarded the WAHO Trophy 2016, with the presentation made on the occasion of this year’s All Nations Cup Festival in Aachen. He has also received VZAP Elite title in 2016 for his special achievements in sports and breeding. This grey stallion was born in 2005. He was approved in Luhmühlen in 2010 and passed the stallion performance test in field that same year. Not only was this the beginning of a successful breeding career for AL ASHAR, it also started a sports career all of us take pride in. His quick forelegs, very good bascule as well as a lot of foresight and ability distinguish this champion show jumper of 2010. To this day AL ASHAR has been incredibly successful in a variety of sport events. This stallion has achieved numerous victories and placements in jumping up to medium class L as well as in dressage. In eventing he has placed within the novice class A. Therefore AL ASHAR easily meets the requirements of the stallion performance test for riding pony breeding. And as if that were not enough, this athletic stallion participated in C-Show events on a national level in 2005 and 2006, where he proved that he is able to draw attention to himself and convince the judges of his high quality. Furthermore, AL ASHAR has distinguished himself as a sire. Besides the award-winning offspring of his own breed, he has also accomplished a lot outside of his own race. With AL ASHAR, an Arabian stud stallion was once again on the Landgestüt Dillenburg this season. The experts there have chosen this purebred Arabian horse for refinement of breed. This stallion distinguishes himself with his outstanding temperament, his willingness to perform, his honesty and heart.